Some would argue that they got the best jobs in the world, and being a footballer was a dream of many of us. They play football for a living and it doesn’t get much better than that. One more benefit of this job is abundance of money which they spend on some serious cars. 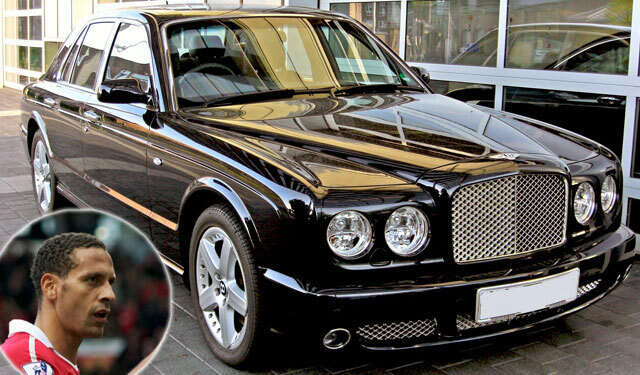 Here are 12 most expensive cars among footballers. Aston Martin produces cars with timeless design and top level engineering. Lot of wealthy people recognize those qualities, which made it one of the top choices among rich and famous. 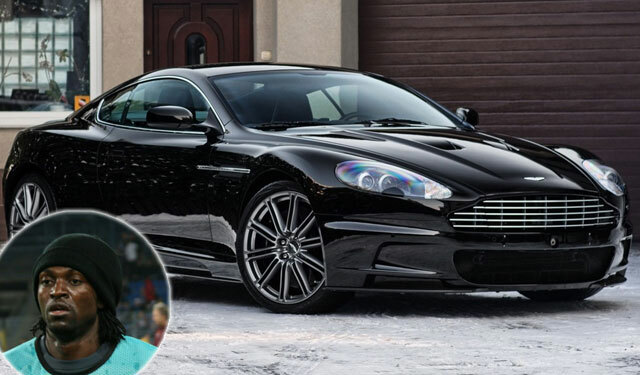 Wayne Rooney got himself Aston Martin Vanquish S which set him back around 152 thousand pounds or $230K. 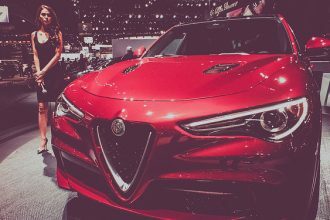 When it comes to performance, this car is close to the top. It develops well over 500 HP and it will hit 60 miles per hour in little over 4 seconds. 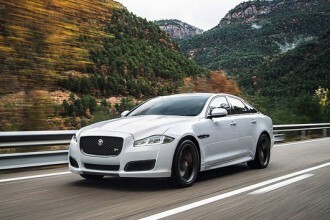 It is definitely one of the best looking cars and it shows class, speed and luxury, all rolled into one car. Even though it is the last place on our list, because of its price, it doesn’t really fall behind any of the other cars. Bentley has always been a synonym for luxury and lot of wealthy people are attracted to this brand just because of that reason. One of those luxury Bentleys found its way to Rio Ferninand which paid 158K of British pounds or $240K for Arnage model. It is one of their earlier models which actually can be seen by the exterior design, but when it comes to interior, level of luxury is really impressive and it can be compared to most luxurious cars of today. Bentley Arnage develops somewhere around 500HP depending on the version, and even though it is a huge car, it still has impressive performance numbers. It is not really a looker, but a car like this definitely stands out wherever it is. 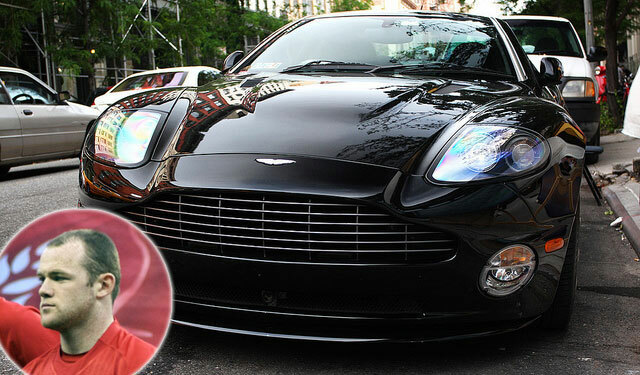 Just like Rooney, Adebayor recognized the qualities of British cars and he got Aston Martin DBS V12. Its 6 liter V12 produces one of the best noises in car industry, which gets the blood boiling of everyone around it. Even though this is a high performance car, it isn’t necessarily all about numbers. It has more important job and that’s to give you the best driving pleasure available. It is definitely one of the cars which stand out the most, whether it is because of design, that amazing engine roar or its overall uniqueness. However, none of this comes cheap and Adebayor had to pay just over 165K of GBP or $250K for his, but considering his earnings, he probably doesn’t sweat over it. Ferrari is definitely one of the global symbols of success and each one of their models is special in its own way. They are the company with racing heritage like no other, and that of course reflects on their cars. Mezut Ozil got himself a Ferrari 458 which is one of the best driver’s cars of today. 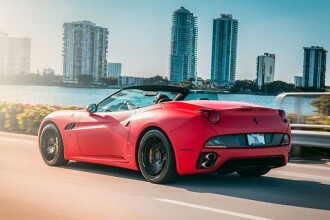 Its V8 engine develops around 560 HP and it has that awesome sound that only comes from Ferrari. Design wise, it also stands out and it doesn’t look like anything else on the road. This incredible car will hit 60 miles per hour in 3 seconds and its maximum speed is 200 miles per hour. As we all know Ferraris don’t come cheap, Ozil paid just under £170K or $257K for his. Here is one more Ferrari on our list, and we’re about to see couple more of them. This time it’s Ferrari 612 Scaglietti, which isn’t the prettiest Ferrari, but nonetheless it is an incredible machine. 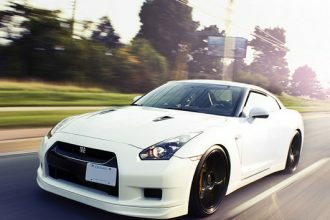 This car is equipped with a 6 liters V12 engine which develops 540 HP and its top speed is just under 200 miles per hour. One thing that separates this car from traditional Ferrari is the front mounted engine, and the 4 seats. Interior is amazing and it is mainly focused on luxury. The car is basically set up in this way. It is all about cruising in comfort. Just like all Ferraris, this one also comes with a hefty price, and with all the options Lampard paid £200K or $302K for his. This is undoubtedly one of the prettiest Ferraris ever, and not everyone can get their hands on one. However, Balotelli is known as car enthusiast and he managed to acquire one. 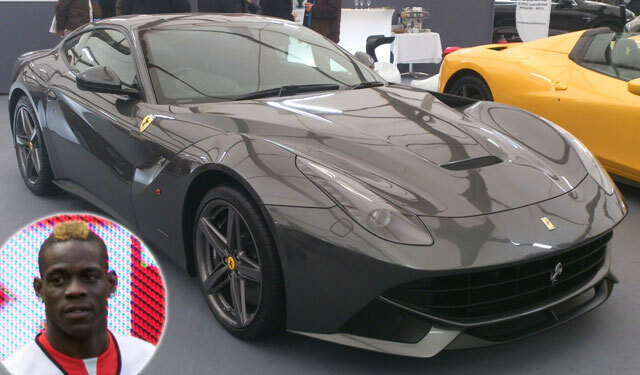 Ferrari F12 Berlinetta has V12 under the bonnet which develops astonishing 730HP and it’s capable of pushing this car to 60mph in 3.1 seconds, giving it the maximum speed of around 210 miles per hour. It is definitely a piece of art, and the flawless design which is rather aggressive, but still smooth make this car stunning. Even though it is a high performance car, it is easy to live with every day. It is tamed in traffic and it is not overly unpractical. 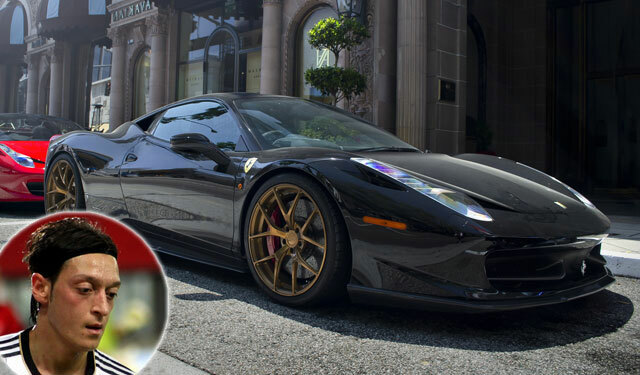 This breathtaking car cost Balotelli £240K or $363K, but that’s just pocket change for him. Our list is getting more serious by each car and it is time for Mercedes SLR McLaren which is a dream car of many of us. When this car came out it offered everything latest in engineering and technology, although, the creator of this car wasn’t really happy with design. It is one of them poster cars which will never be forgotten, and considering its rareness, overall quality and performance, it really is a legendary car. McLaren SLR is equipped with a 5.4 liter supercharged engine which generates 617 horsepower, and that is enough to push this car to 60 mph in 3.7 seconds. Considering its uniqueness, price also shouldn’t be a surprise. Obafemi had to pay £330K or $500K for his. 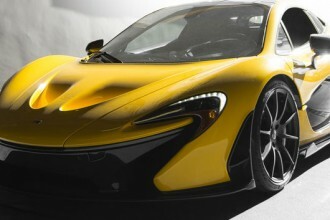 One more well known player was seduced by McLarens Looks, sound and overall quality. However, two McLarens from these two players are somewhat different. Even though they use the same engines, Obafemi McLaren is convertible which means that it weighs more due to the support beams, which means that the performance as well as handling is going to be somewhat worse. 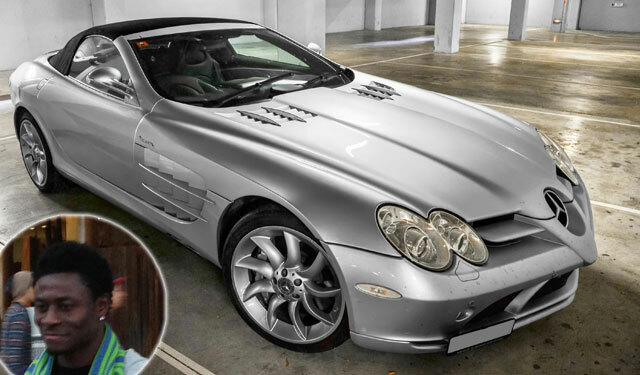 El Hadji’s Mercedes Benz SLR will hit 60 miles per hour in 3.4 seconds, which isn’t a huge difference, but it’s a difference nonetheless. His car is chrome making this player and his car stand out wherever he goes. As you have just seen, a car like this isn’t cheap in any way, and Diouf’s car is even more expensive at £420K or $636K. Ibrahimovic knows what’s good and he got himself one of the best cars on the planet right now. It’s a Porsche 918 Spyder which offers all the latest from the car industry. 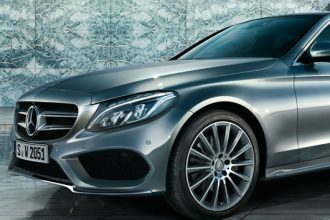 It’s a very complex car which delivers performance out of this world with its combination of petrol and electric motors. This computer on wheel is insanely fast thanks to the whole system which delivers almost 900HP combined and it will go from 0 to 60 mph in unbelievable 2.2 seconds. Porsche made a true modern engineering marvel which has basically only two competitors, the P1 and LaFerrari. As you can imagine a car like this is not cheap in any way, and it set Ibrahimovic back almost £620K or $938K, but not even that is too much if you truly love cars. Bugatti Veyron has been on top of the world when it comes to speed for a while, mainly due to its incredible engineering. Its engine is truly amazing, it is a W16 which produces over 1000Hp, but depending on the version this number can go all the way up to 1200. It has basically two engines which are fused together and powered by 4 turbo chargers. This kind of setup produces tremendous amount of heat, that’s why Bugatti is equipped with ten radiators. When it comes to performance, it was unsurpassed for a while, it will reach 60mph in 2.5 seconds and its maximum speed exceeds 250 miles per hour, making this car fastest in the world for good number of years. 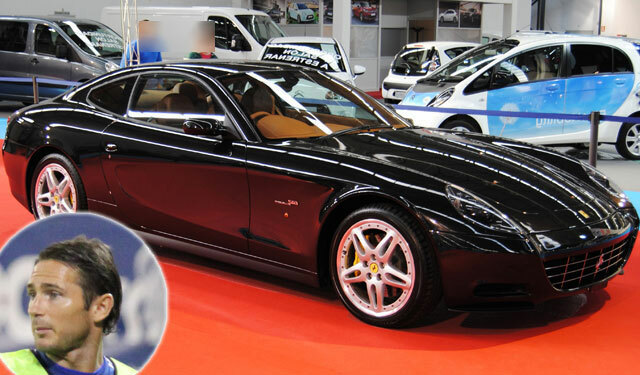 Eto’o spent over £1.5 million or $2.27M for his dream car. 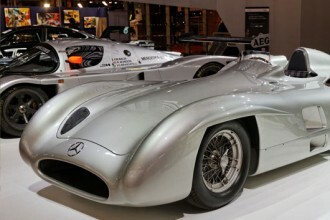 As we mentioned previously, this car is truly engineering masterpiece and it is an ultimate symbol of success. Those are probably the reasons Benzema decided to get one, because looks can’t be one of them. If we have to find one drawback it would probably be the design, both exterior and interior. If you take a look at the cars that are on the same level, they look much better and they are a lot more appealing, however, this doesn’t make Veyron any less of a car. 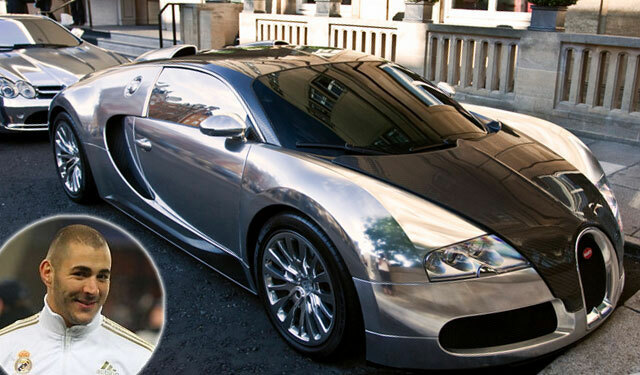 Whatever the case is, Benzema got himself chrome Bugatti Veyron and it costs even more than the one Eto’o possesses. 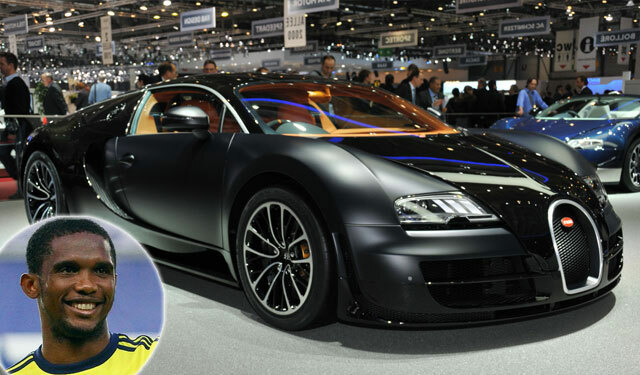 Benzema paid £1.52 million or $2.3M for his Bugatti, but that probably isn’t a lot to him. Ultimate driver got himself the ultimate car. It is arguably one of the best cars in the world and it is Ferrari’s answer to other hypercars. 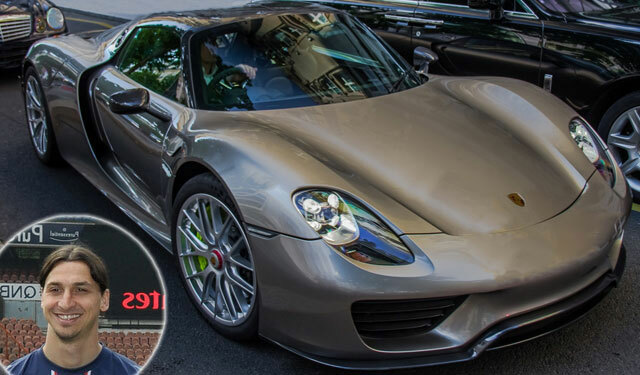 Just like 918 Spyder, this car also gets its amazing performance from both petrol and electric motors which develop combined 963 HP, giving this car acceleration and speed that’s rarely seen. 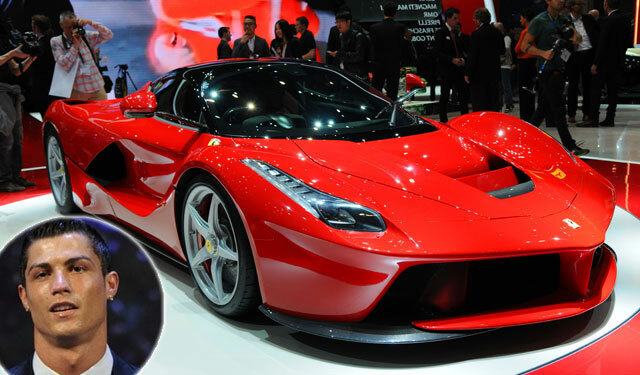 Besides its amazing performance, Ferrari LaFerrari is one of the best looking cars in the world, no doubt about it. It really is a dream car, and not everyone can get one, but since Ronaldo is probably the best football player in the world, it certainly wasn’t too much of a hassle. 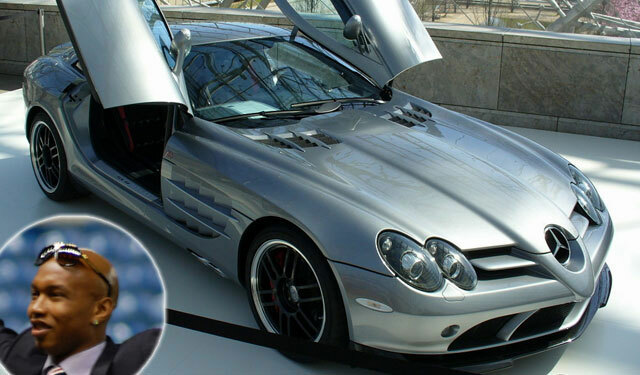 When it comes to price, Ronaldo supposedly paid £2 million or $3.02M for this incredible car.